It is a truth universally acknowledged that a person of a certain book love must be in want of more books. It is another truth that sometimes two of the aforementioned people will marry each other and have to buy a new bookshelf every six months to keep up with their addictions. That’s us. 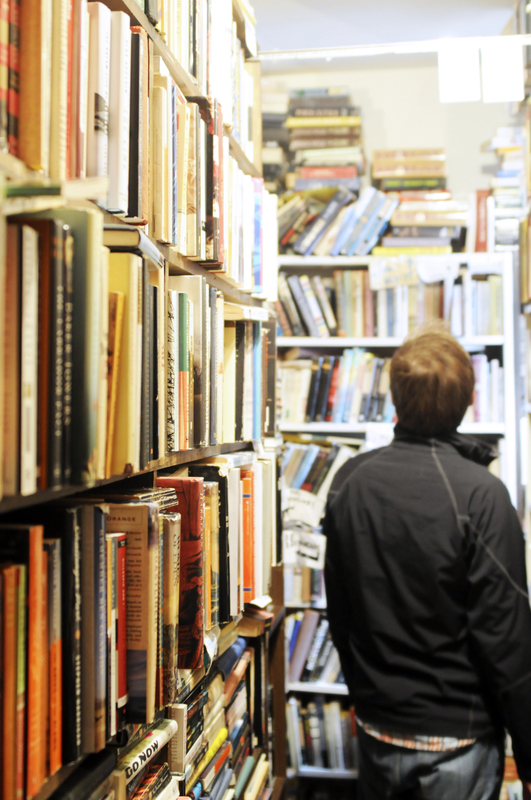 Boy, do we love bookstores [see not at bottom about bookstores, all ye scoffers]. James and I used to go on dates where we would just chill out in bookstores while each perused our own guilty book pleasure: survival books or new history narratives (James), or anything having to do with the Romanov family and Anastasia conspiracies (me). There are the nice bookstores — the fancy ones, the ones that have Starbucks coffee shops inside, plush chairs, and shiny new books. 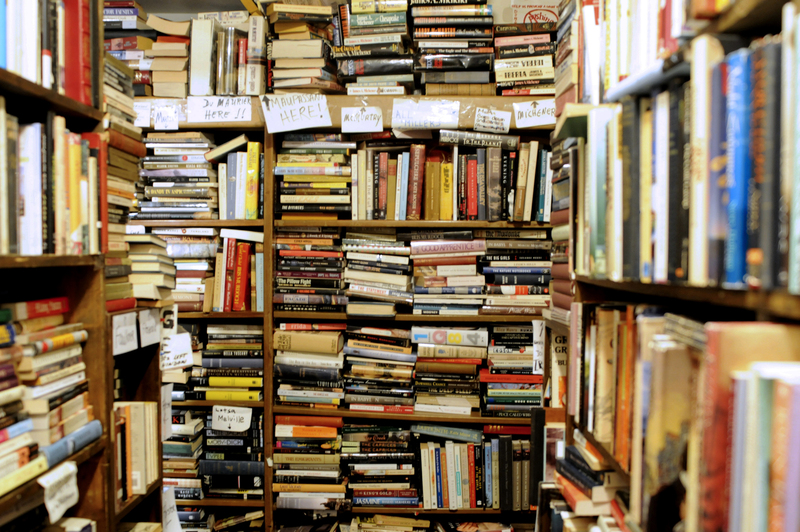 And then there are the used bookstores, the ones that exude personality and attract book hoarders and lovers alike. 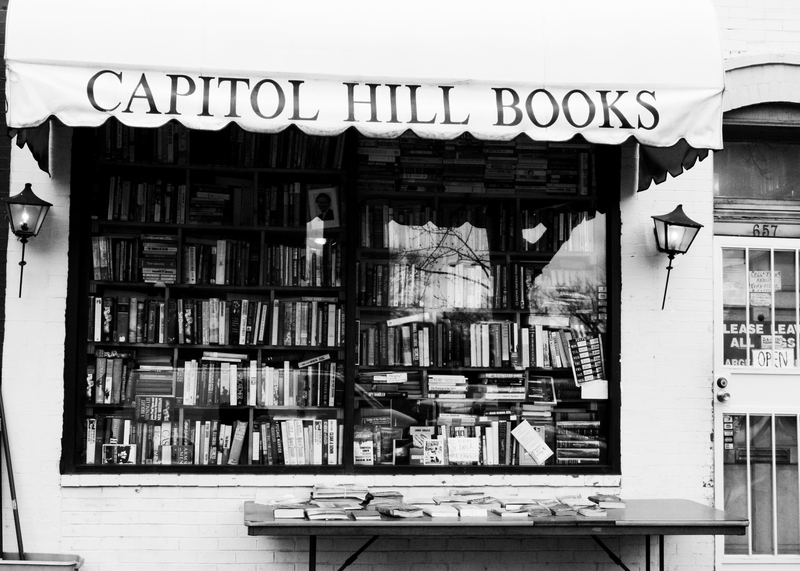 Among this second type is Capitol Hill Books. What it is: Super quirky used bookstore in Eastern Market known for its cramped conditions, awesome collections, eccentric owner and hysterical signs. Why you should be excited: If you are claustrophobic, you probably shouldn’t be excited. But if you grew up getting goose bumps at this scene from Beauty and the Beast (go ahead and watch it… though I should give the disclaimer that Capitol Hill books is much less spacious. ), then you will probably love being tucked away in the stacks of books and finding treasures. Plus, the no-frills signage (ie, Sharpie and index cards) and the posters that forbid, cell phones, back packs, etc. are a nice relief from fancy book stores. In this store, you are constantly reminded of your utter inferiority when compared to books. You are not smarter than them, you are not above them, and they do not need you. Nothing like being put in your place by a bunch on inanimate objects. Any other bookstores you love in DC? Please share! 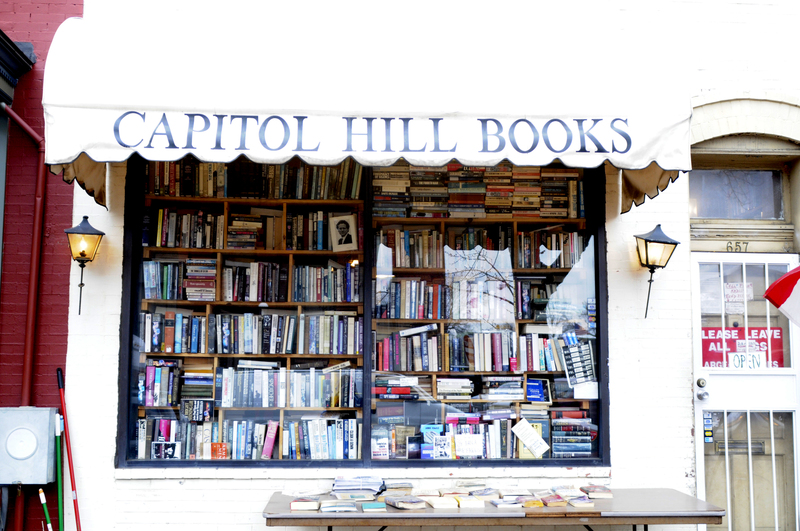 This entry was posted in Uncategorized and tagged books, Capitol Hill, DC, Eastern Market, photography, why i love dc. Bookmark the permalink. I don’t know about DC, but I’m inspired to post soon about two similar bookstores here, one of which has a collection of original Golden Books for children that causes me to drool (and wish I had more book money). Considering how much Callan loves books (at 5 months old) we will definitely be spending a lot of time in bookstores and the library. I am equally obsessed with libraries… free books!!!!!!!!! I also just read books in the store and keep writing down my page number so I can come back. LOVE books. LOVE D.C. LOVE this blog. Oh yeah, and this phrase from your post kinda made me grin: “You are not smatter than them…” 😉 Cutest typo I’ve seen in a while… Just couldn’t resist mentioning it. And yes, the books and this city are the best. GUH. I want to go there! I will, more than likely, be in DC for a conference in October. Obvs, we should meet up at this bookstore. Oooooohhhhhhh. Now I have to come visit DC. As if you need another reason!!!! It’s just a short bus ride away!!! Checked this place out with Madame Gunderson the other day… wow. What a great place! Glad you loved it! Did you happen to see that the foreign selection is in the restroom? Fantastic.